Red-Eyes Fusion is a Normal Spell Card with too many restrictions. I’d rather pay Life Points than be restricted from the Normal Summon. Special Summons I can understand. Once per turn I can understand. Only being able to set a monster for the whole turn is brutal if Red-Eyes Fusion is negated. Other problems arise because there aren’t too many Fusion Monsters that list Red-Eyes as material. However, more seem to pop up every year, so this card has potential. Renaming the Fusion Summoned Monster original Red-Eyes is good for legacy support and potential OTKs. Within the Red-Eyes deck, this card is highly searchable. Finally, going from the deck has distinct advantages in grave set up. Red-Eyes Fusion needs to go first and is high risk high reward. Now there just needs to be a Quickplay Fusion Spell and we can reduce this to one. For now, you need it if you’re playing the deck. Red-Eyes Fusion is a nifty (rentsy, remember that word, shoutout to Tranorix) little Fusion card. It could help you with yesterdays card, as well as other Fusions. You get to Fusion Summon any Fusion that has a Red Eyes Monster listed as Fusion, and its name becomes Red Eyes Black Dragon. Said Material for this Fusion can come from your Hand, Field, or Field, which is definitely a plus. You are, however, prevented from Normal OR Special Summoning other Monsters the turn you use this, and you can only use one of these a turn. So that prevents any swarming or OTK possibilities. It’s a quick way to bring out a Fusion, but you’re giving up lots of cards to do it, probably too many cards (at least three, two Monsters, and this card) despite the resource of being able to pull them from anywhere. You’re probably best off not taking them from the Field if you can help it, so you have more than one Monster to attack with, as the number of attacks you can use after this isn’t limited. Throwback Thursday this week isn’t Red-Eyes B. Dragon, but it is a card that started the Legacy Support that Red-Eyes got over the last two years, and is a constant for most of the Red-Eyes builds, Red-Eyes Fusion. 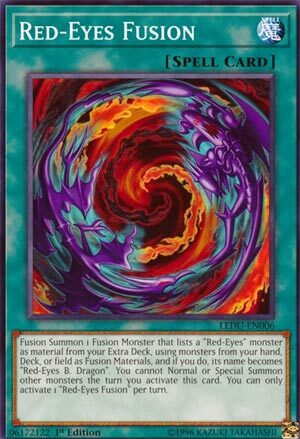 Red-Eyes Fusion allows you to Fusion Summon, duh, a Fusion that lists a Red-Eyes monster as material by using monsters from your hand, field, or deck as Fusion Material and the Fusion Summoned monster’s name becomes Red-Eyes B. Dragon. Using the deck is neat for a Fusion card, it holds you back from summoning when you activate this card, but the Fusions you have access to are worth it in my opinion. You can only activate 1 Red-Eyes Fusion a turn, but that isn’t the end of the world really. The beginning of the Red-Eyes support, you will see it a lot in any Red-Eyes variant that has Fusion Monsters. It is just that good.